A corn (also termed clavus) is a thickening of the skin due to intermittent pressure and frictional forces. These forces result in hyperkeratosis, clinically and histologically. The extensive thickening of the skin in a corn may result in chronic pain, particularly in the forefoot; in certain situations, this thickening may result in ulcer formation. The word clavus has many synonyms and innumerable vernacular terms, some of which are listed in the Table below; these terms describe the related activities that have induced clavus formation. Clinically, all these lesions look like hyperkeratotic or thickened skin. Maceration and secondary fungal or bacterial infections are a common overlying feature in heloma molle and diabetes. Plantar helomas tend to have a central keratin plug, which, when pared, reveals a clear, firm, central core. The most common sites for clavus formation are the feet, specifically the dorsolateral aspect of the fifth toe for heloma durum, in the fourth interdigital web of the foot for heloma molle, and under the metatarsal heads for calluses. Clinically, three types of corns have been described. The first is a hard corn, or heloma durum, notable for its dry, horny appearance. It is found most commonly over the interphalangeal joints. The second is a soft corn, or heloma molle, described as such because of its macerated texture secondary to moisture. It is generally found in interdigital locations. [5, 6] The third type is a periungual corn, and this type occurs near or on the edge of a nail. Note the image below. Hard corn over the proximal interphalangeal joint of second toe. Courtesy of James K. DeOrio, MD. Corns are often misdiagnosed as calluses, which are also hyperkeratotic skin lesions resulting from excess friction. However, calluses develop from forces distributed over a broad area of skin, whereas corns develop from more localized forces. Calluses are often considered desirable for some activities (eg, gymnastics, weightlifting), and they lack a central core, which is characteristically revealed in corns upon removal of the upper hyperkeratotic layer of skin. Corns can occur within an area of callus,  such as on the plantar surface. Note the image below. 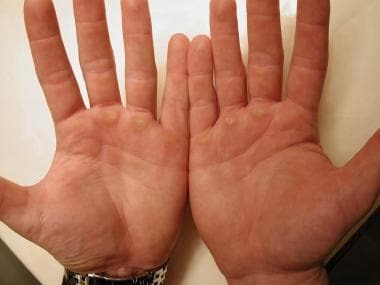 Calluses on the palmar surface of the hands of a body builder. Courtesy of James K. DeOrio, MD. A clinical image of a screwdriver operator's clavus is below. Screwdriver operator's callus (ie, clavus). Toe deformity, including contractures and claw, hammer, and mallet-shaped toes, may contribute to pathogenesis. Deformity of the feet from underlying conditions such as rheumatoid arthritis can contribute to clavus formation. Bunionettes, ie, callosities over the lateral fifth metatarsal head, may be associated with neuritic symptoms due to compression of the underlying lateral digital nerves. Furthermore, Morton toe, in which the second toe is longer than the first toe, occurs in 25% of the population; this may be one of the most important pathogenic factors in a callus of the common second metatarsal head, ie, an intractable plantar keratosis. Both hard and soft corns are caused by pressure from unyielding structures. Abnormal mechanical stress may be intrinsic or extrinsic. Intrinsic factors include foot deformities (eg, hammer toe, bunion)  ; abnormal foot mechanics (acquired or hereditary); and peripheral neuropathy. Extrinsic factors include poorly fitting footwear and heavy activity (athletics). A 2005 study conducted by Menz et al reported that in older populations, plantar pressures are significantly higher under callused regions of the foot. These data support the idea that increased pressures are related to a hyperkeratotic response and that the target for treatment should be eliminating excess pressures on the foot. Rheumatoid arthritis  : About 17% of patients with rheumatoid arthritis present with intractable foot pain. Chronic arthritis leads to foot deformities and consequent callus formation. Bleeding into callosities in patients with rheumatoid arthritis may be a sign of rheumatoid angiitis. Diabetes mellitus with associated peripheral neuropathy  : In patients with diabetes, chronic callosities in the presence of neurovascular deterioration may lead to ulcerations and superinfections. Corns are one of the most common foot conditions in the United States, particularly amongst older patients. It is a common disorder because of the frequency of usage of occlusive footwear and participation in repetitive activities, such as running. Corns are common worldwide. Any weight-bearing human is susceptible to the development of corns. Amongst elderly populations, both men and women have been reported to wear shoes too narrow for their feet. Women have been reported to wear shoes that are also shorter than their feet. Both narrow and short footwear can lead to the development of corns, in addition to foot deformities. They are more common in women than in men because of this use of occlusive and poorly fitted footwear. Anyone can have a clavus, but most individuals acquire the risk factors for clavus formation after puberty because of the onset of traumatic footwear use, repetitive motion injuries, and progressive foot deformities. Recurrence is common. The most common symptoms associated with corns are pain upon ambulation and restriction of activity secondary to pain. Corns are generally not associated with mortality; however, recognizing the potential for a maltreated corn, soft corns in particular, to develop into a life-threatening secondary infection (bacterial or fungal) is important in patients with diabetes mellitus or immunosuppression. The prognosis depends on the underlying cause of the callous formation and whether interventions can successfully be introduced to eliminate the repetitive motion. Chronic clavus generally occurs because of the difficulty in removing inciting factors in most situations. Extensive thickening of the skin may result in chronic pain, particularly in the forefoot; in certain situations, ulcer formation may result. Clavus may be a sign of underlying neuropathy due to diabetes or neuroborreliosis, or owing to the deformities of rheumatoid arthritis. In the case of neuropathy, a clavus may hide ulceration or denote abnormal neurovasculature of the feet. In the case of rheumatoid arthritis, corns may enhance the pain of deformed joints. See Type 1 Diabetes Mellitus, Type 2 Diabetes Mellitus, and Diabetic Foot Infections for follow-up information. Patients must be taught to wear less traumatic footwear, such as shoes with a wide toe space. Using inner soles, lowering the heel (if second metatarsal head lesions are present), and preventing the repetitive injuries that cause occupational clavus formation may be helpful. Review of proper footwear and trauma reduction may reduce disease severity over time. For patient education resources, see the patient education article Corns and Calluses. Mann RA. Pain in the foot. 1. Evaluation of foot pain and identification of associated problems. Postgrad Med. 1987 Jul. 82 (1):154-7, 160-2. [Medline]. Cheon JJ, Uhm JY, Kang GH, Kang EG, Kim SY, Chang SS. Evaluation of the dermatologic life quality among cleanroom workers in a secondary battery factory. Ann Occup Environ Med. 2016. 28 (1):39. [Medline]. Freeman DB. Corns and calluses resulting from mechanical hyperkeratosis. Am Fam Physician. 2002 Jun 1. 65(11):2277-80. [Medline]. Farndon L, Concannon M, Stephenson J. A survey to investigate the association of pain, foot disability and quality of life with corns. J Foot Ankle Res. 2015. 8:70. [Medline]. Murphy GA. 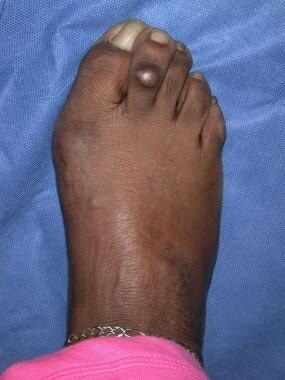 Lesser Toe Abnormalities: Corns (Helomata and Clavi). Canale ST, ed. Canale: Campbell's Operative Orthopaedics. 10th. St. Louis, Mo: Mosby; 2003. 4063-5. Singh D, Bentley G, Trevino SG. Callosities, corns, and calluses. BMJ. 1996 Jun 1. 312(7043):1403-6. [Medline]. [Full Text]. Snider RK. Corns and Calluses. Greene WB, ed. Essentials of Musculoskeletal Care. 2nd ed. Rosemont, Ill: American Academy of Orthopaedic Surgeons; 2001. 437-41. DeLauro TM, DeLauro NM. Corns and Calluses. Wolff K, Goldsmith LA, Katz SI, Gilchrest BA, Paller AS, Leffell DJ, eds. Fitzpatrick's Dermatology in General Medicine. 7th ed. New York, NY: McGraw-Hill; 2008. 97. Kennedy CTC, Burd DAR. Mechanical and Thermal Injury. Burns T, Breathnach SM, Cox N, Griffiths CE, eds. Rook's Textbook of Dermatology. 7th ed. London, England: Blackwell Science; 2004. 22. Viegas SF, Torres FG. Cherry pitter's thumb. Case report and review of the literature. Orthop Rev. 1989 Mar. 18 (3):336-8. [Medline]. Villano PA, Ruocco V, Pisani M. The cameo engraver's corn. Int J Dermatol. 1990 Jul-Aug. 29 (6):424-5. [Medline]. Scott MJ Jr, Scott NI, Scott LM. Dermatologic stigmata in sports: weightlifting. Cutis. 1992 Aug. 50 (2):141-5. [Medline]. Mishriki YY. Skin commotion from repetitive devotion. Prayer callus. Postgrad Med. 1999 Mar. 105 (3):153-4. [Medline]. O'Goshi KI, Aoyama H, Tagami H. Mucin deposition in a prayer nodule on the forehead. Dermatology. 1998. 196 (3):364. [Medline]. Maharaj D, Naraynsingh V. Cigarette lighter thumb. Am J Med. 2001 Apr 15. 110 (6):506. [Medline]. Kanerva L. Knuckle pads from boxing. Eur J Dermatol. 1998 Jul-Aug. 8 (5):359-61. [Medline]. Daluiski A, Rahbar B, Meals RA. Russell's sign. Subtle hand changes in patients with bulimia nervosa. Clin Orthop Relat Res. 1997 Oct. 107-9. [Medline]. Koh D, Jeyaratnam J, Aw TC. An occupational mark of screwdriver operators. Contact Dermatitis. 1995 Jan. 32 (1):46. [Medline]. Heyl T, Raubenheimer EJ. Sucking pads (sucking calluses) of the lips in neonates: a manifestation of transient leukoedema. Pediatr Dermatol. 1987 Aug. 4 (2):123-8. [Medline]. Gibbs RC. "Vamp disease". J Dermatol Surg Oncol. 1979 Feb. 5 (2):92-3. [Medline]. Vaseenon T, Intharasompan P, Wattanarojanapom T, Theeraamphon N, Auephanviriyakul S, Phisitkul P. Foot and ankle problems in Muay Thai kickboxers. J Med Assoc Thai. 2015 Jan. 98 (1):65-70. [Medline]. Patruno C, Napolitano M, La Bella S, Ayala F, Balato N, Cantelli M, et al. Instrument-related Skin Disorders in Musicians. Dermatitis. 2016 Jan-Feb. 27 (1):26-9. [Medline]. Hirao M, Ebina K, Shi K, Tomita T, Noguchi T, Tsuboi H, et al. Association between preoperative pain intensity of MTP joint callosities of the lesser toes and fore-mid-hindfoot deformities in rheumatoid arthritis cases. Mod Rheumatol. 2017 Jan. 27 (1):50-53. [Medline]. Goksugur N, Cakici H. A new computer-associated occupational skin disorder: Mousing callus. J Am Acad Dermatol. 2006 Aug. 55 (2):358-9. [Medline]. Cox NH, Finlay AY. Callosities of crossed-leg sitting. Int J Dermatol. 2009 Nov. 48 (11):1266-7. [Medline]. Williams ML, Elias PM. Enlightened therapy of the disorders of cornification. Clin Dermatol. 2003 Jul-Aug. 21(4):269-73. [Medline]. Coughlin MJ, Kennedy MP. Operative repair of fourth and fifth toe corns. Foot Ankle Int. 2003 Feb. 24(2):147-57. [Medline]. Menz HB, Zammit GV, Munteanu SE. Plantar pressures are higher under callused regions of the foot in older people. Clin Exp Dermatol. 2007 Jul. 32(4):375-80. [Medline]. Erkek E, Koçak M, Bozdoğan O, Atasoy P, Birol A. Focal acral hyperkeratosis: a rare cutaneous disorder within the spectrum of Costa acrokeratoelastoidosis. Pediatr Dermatol. 2004 Mar-Apr. 21 (2):128-30. [Medline]. Manalo FB, Marks A, Davis HL Jr. Doxorubicin toxicity. Onycholysis, plantar callus formation, and epidermolysis. JAMA. 1975 Jul 7. 233 (1):56-7. [Medline]. Oriba HA, Lo JS, Bergfeld WF. Callused feet, thick nails, and white tongue. Pachyonychia congenita. Arch Dermatol. 1991 Jan. 127 (1):113-4, 116-7. [Medline]. Wollina U, Mohr F, Schier F. Unilateral hyperhidrosis, callosities, and nail dystrophy in a boy with tethered spinal cord syndrome. Pediatr Dermatol. 1998 Nov-Dec. 15 (6):486-7. [Medline]. Robbins JM, Ballew KK, Lowery CR, Husni EA. Asymptomatic occlusive arterial disease. A case report. J Am Podiatr Med Assoc. 1985 Nov. 75 (11):616-8. [Medline]. Coughlin MJ. Common causes of pain in the forefoot in adults. J Bone Joint Surg Br. 2000 Aug. 82(6):781-90. [Medline]. Verbov JL, Monk CJ. Talar callosity--a little-recognized common entity. Clin Exp Dermatol. 1991 Mar. 16 (2):118-20. [Medline]. Oztekin HH, Boya H, Nalcakan M, Ozcan O. Second-toe length and forefoot disorders in ballet and folk dancers. J Am Podiatr Med Assoc. 2007 Sep-Oct. 97 (5):385-8. [Medline]. Baccouche D, Mokni M, Ben Abdelaziz A, Ben Osman-Dhahri A. [Dermatological problems of musicians: a prospective study in musical students]. Ann Dermatol Venereol. 2007 May. 134 (5 Pt 1):445-9. [Medline]. Gambichler T, Uzun A, Boms S, Altmeyer P, Altenmüller E. Skin conditions in instrumental musicians: a self-reported survey. Contact Dermatitis. 2008 Apr. 58 (4):217-22. [Medline]. Verma SB, Wollina U. Callosities of cross legged sitting: "yoga sign"--an under-recognized cultural cutaneous presentation. Int J Dermatol. 2008 Nov. 47 (11):1212-4. [Medline]. Darvall WA. Flash dancing and spine bumps. Med J Aust. 1984 Apr 28. 140 (9):568. [Medline]. Lemont H, Ravick A. Hemorrhage within plantar callus. 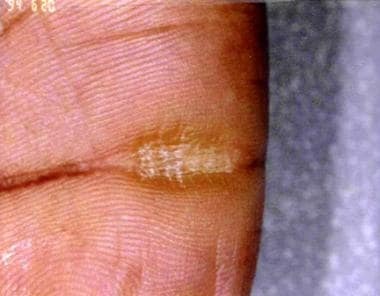 A cutaneous sign of rheumatoid angiitis. J Am Podiatry Assoc. 1980 Jan. 70 (1):22-5. [Medline]. Murray HJ, Young MJ, Hollis S, Boulton AJ. The association between callus formation, high pressures and neuropathy in diabetic foot ulceration. Diabet Med. 1996 Nov. 13 (11):979-82. [Medline]. Dunn JE, Link CL, Felson DT, Crincoli MG, Keysor JJ, McKinlay JB. Prevalence of foot and ankle conditions in a multiethnic community sample of older adults. Am J Epidemiol. 2004 Mar 1. 159(5):491-8. [Medline]. Black JR, Hale WE. Prevalence of foot complaints in the elderly. J Am Podiatr Med Assoc. 1987 Jun. 77(6):308-11. [Medline]. Benvenuti F, Ferrucci L, Guralnik JM, Gangemi S, Baroni A. Foot pain and disability in older persons: an epidemiologic survey. J Am Geriatr Soc. 1995 May. 43(5):479-84. [Medline]. Habif TP. Warts, Herpes Simplex and other Viral Infections. Clinical Dermatology: A Color Guide to Diagnosis and Therapy. 4th ed. St. Louis, Mo: Mosby; 2004. 374-5. Mann RA, DuVries HL. Intractable plantar keratosis. Orthop Clin North Am. 1973 Jan. 4(1):67-73. [Medline]. Bae JM, Kang H, Kim HO, Park YM. Differential diagnosis of plantar wart from corn, callus and healed wart with the aid of dermoscopy. Br J Dermatol. 2009 Jan. 160(1):220-2. [Medline]. Kurvin L, Volkering C. [Diagnosis and treatment of warts, corns, and clavi]. MMW Fortschr Med. 2007 Mar 8. 149 (10):31-3. [Medline]. Dainichi T, Honma Y, Hashimoto T, Furue M. Clavus detected incidentally by positron emission tomography with computed tomography. J Dermatol. 2008 Apr. 35 (4):242-3. [Medline]. Sage RA, Webster JK, Fisher SG. Outpatient care and morbidity reduction in diabetic foot ulcers associated with chronic pressure callus. J Am Podiatr Med Assoc. 2001 Jun. 91(6):275-9. [Medline]. Thomas JR 3rd, Doyle JA. The therapeutic uses of topical vitamin A acid. J Am Acad Dermatol. 1981 May. 4 (5):505-13. [Medline]. Dehghani F, Merat A, Panjehshahin MR, Handjani F. Healing effect of garlic extract on warts and corns. Int J Dermatol. 2005 Jul. 44 (7):612-5. [Medline]. Foster A, Edmonds ME, Das AK, Watkins PJ. Corn cures can damage your feet: an important lesson for diabetic patients. Diabet Med. 1989 Dec. 6(9):818-9. [Medline]. George WM. Linear lymphatic hypopigmentation after intralesional corticosteroid injection: report of two cases. Cutis. 1999 Jul. 64 (1):61-4. [Medline]. Bevans JS, Bosson G. A comparison of electrosurgery and sharp debridement in the treatment of chronic neurovascular, neurofibrous and hard corns. A pragmatic randomised controlled trial. Foot (Edinb). 2010 Mar. 20(1):12-7. [Medline]. Balkin SW. Injectable silicone and the foot: a 41-year clinical and histologic history. Dermatol Surg. 2005 Nov. 31(11 Pt 2):1555-9; discussion 1560. [Medline]. Richards RN. Calluses, corns, and shoes. Semin Dermatol. 1991 Jun. 10(2):112-4. [Medline]. Nagel A, Rosenbaum D. Vacuum cushioned removable cast walkers reduce foot loading in patients with diabetes mellitus. Gait Posture. 2009 Jul. 30 (1):11-5. [Medline]. Cordoro KM, Ganz JE. Training room management of medical conditions: sports dermatology. Clin Sports Med. 2005 Jul. 24(3):565-98, viii-ix. [Medline]. Stephenson J, Farndon L, Concannon M. Analysis of a trial assessing the long-term effectiveness of salicylic acid plasters compared with scalpel debridement in facilitating corn resolution in patients with multiple corns. J Dermatol. 2016 Jun. 43 (6):662-9. [Medline]. Balkin SW. Silicone injection for plantar keratoses. Preliminary report. J Am Podiatry Assoc. 1966 Jan. 56(1):1-11. [Medline]. Field LM. Letter: injectable silicone for painful interdigital neurovascular clavi and verrucae. Dermatol Surg. 2006 Dec. 32(12):1535. [Medline]. Narins RS, Beer K. Liquid injectable silicone: a review of its history, immunology, technical considerations, complications, and potential. Plast Reconstr Surg. 2006 Sep. 118(3 Suppl):77S-84S. [Medline]. Brousseau-Foley M, Cantin V. Digital and interdigital corns: a report of two cases with use of hyaluronic acid gel filler. J Am Podiatr Med Assoc. 2014 Jul. 104(4):413-6. [Medline]. McDowell BA. Carbon dioxide laser excision of benign pedal lesions. Clin Podiatr Med Surg. 1992 Jul. 9 (3):617-32. [Medline]. Akdemir O, Bilkay U, Tiftikcioglu YO, Ozek C, Yan H, Zhang F, et al. New alternative in treatment of callus. J Dermatol. 2011 Feb. 38 (2):146-50. [Medline]. González-Ramos J, Sendagorta-Cudós E, González-López G, Mayor-Ibarguren A, Feltes-Ochoa R, Herranz-Pinto P. Efficacy of botulinum toxin in pachyonychia congenita type 1: report of two new cases. Dermatol Ther. 2016 Jan-Feb. 29 (1):32-6. [Medline]. Dockery GL, Nilson RZ. Intralesional injections. Clin Podiatr Med Surg. 1986 Jul. 3(3):473-85. [Medline]. Lee KB, Park JK, Park YH, Seo HY, Kim MS. Prognosis of painful plantar callosity after hallux valgus correction without lesser metatarsal osteotomy. Foot Ankle Int. 2009 Nov. 30 (11):1048-52. [Medline]. Atlan M, Naouri M, Lorette G, Estève E, Zakine G. [Original treatment of constitutional painful callosities by surgical excision, collagen/elastin matrix (MatriDerm(®)) and split thickness skin graft secured by negative wound therapy]. Ann Chir Plast Esthet. 2011 Apr. 56 (2):163-9. [Medline]. Hard corn on the lateral surface of fifth toe. Courtesy of James K. DeOrio, MD. The authors and editors of Medscape Reference gratefully acknowledge the contributions of previous authors Ali Hendi, MD; Douglas W. Kress, MD; and Roger Patrick, MD, to the development and writing of this article.